All of your travel packages possible to make mixtures one activity to another travel activities for example trekking with historical monument cities tours, mountain flight, rafting, Jungle safari or possible make to multi country travel such as Nepal with Tibet or Bhutan and India. Whatever, we have some Multi adventure packages which is more tourists decided to express on their holiday trips with us. 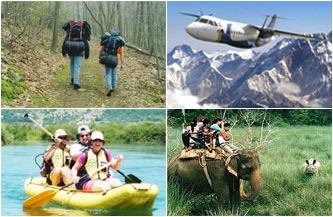 Multi adventure tours in Nepal give taste of Nepal for family, friends and individual travelers. Our travel services in Nepal are trekking, peak climbing, expedition, rafting, sightseeing, day hiking, Jeep tour, motor biking, mountain biking, mountain flight, Helicopter tour, honeymoon tour, Bungy jumping, Paragliding, Jungle Safari, Yoga and meditation all this travel activities are our major service which is possible to offer in mixture trip given name as Multi Adventure Trips. Just we need to know your desire then we will create the multi propose program itinerary for Multi adventure even only in Nepal or with neighboring Himalayan destinations (Tibet, Bhutan and India).